Welcome to the weekend. Welcome to my – Saturday link up s~A(R)T~urday! My apologies that I have not been around, commenting, answering comments lately. It just has been one of those weeks. So, without further ado my latest Photoshop creation: The ManCat 🙂 A symbiosis of zoom blur and Photoshop layering. Last weeks last entry at s~A(R)T~urday was Mascha’s entry.She creates wonderful collages incorporating magazine snippets into her journal – gorgeous! Well worth visiting every week: Maschas Buch! Claudia, this sorta gives me the creeps. lol Interesting effect. I’ve played with a little myself, but have yet to find the right use for it yet. Thanks for hosting! What an amazing photo! I really like the way this one has turned out. On particularly rough take-offs, I’ve thought that the sky was trying to gobble us up – for daring to enter her space. LOL! This is great! Thanks for the laugh cuz today I really needed it. The photo reminds me too of my father, who was a pilot and flight instructor for small airplanes. He loved his job so much and always looked so happy in the sky. Been kinda missing him today and your photo made me smile. Thanks! 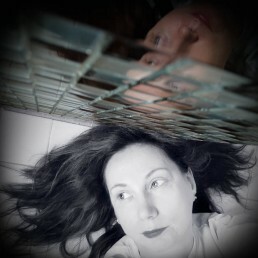 Claudia, I did two photo-art creations this week, so I linked up a second time. I hope you don’t mind. Have a good weekend! ooooh, groovy cool!!! a love that it’s a bit psychedelic feel. a bit different, and I like that – exploring your creativity. Very unique indeed. The thumbnail was intriguing! I always love Mascha’s collages! The ManCat? I can’t help thinking of the Cheshire Cat, of course!! And of summer days – of which we are NOT experiencing today. I saw this on Facebook and was fascinated by it. I love the blur and the colors. It looks like a shot from a movie with the airplanes in the foreground.